Sunday’s historic double-canonisation has involved modifying or suspending the normal legal processes the Church uses to verify sanctity. But that’s not because John XXIII and John Paul II are popes but because the fame and devotion they inspire are all the evidence that is needed. From the earliest days of the Church such men and women have been declared saints without the need for research into their heroic virtues or the proof of miracles. 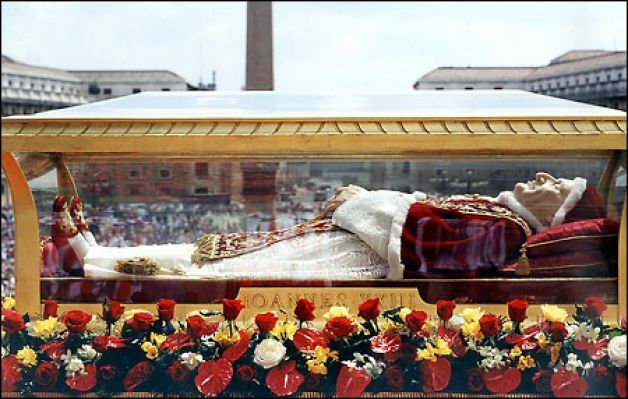 John XXIII’s coffin during solemn procession in St Peter’s Square in 2001. At diocesan level, a local bishop gives permission for an investigation to begin into the life and writings of a Catholic who has died; if, following this investigation, the local bishop is satisfied that there is a case for canonisation, the candidate saint is recognised as ‘Servant of God’, and his or her case is sent to the Congregation for the Causes of Saints for further investigation. The Congregation appoints a postulator who examines whether the candidate saint lived a life of ‘heroic virtue’ and addresses objections and doubts that might raised; eventually the Congregation may ask the Pope to declare the candidate saint ‘Venerable’. Evidence is then gathered to determine if a miracle has occurred through the intercession of a candidate saint; a miracle, for the purposes of canonisation, is regarded as being ‘the immediate, complete, and spontaneous cure of a serious and pathological disease or condition which medical science cannot explain or refute’. After this, the candidates may be beatified – that is, the Church teaches that it is worthy of belief that they are ‘Blessed’, and are in the presence of God. After a second miracle has been authenticated, the blessed may then be recognised as saints and honoured as such by the whole Church; a canonisation Mass is held, and a Feast Day is established. The procedures exist to aid the Pope, not to constrain him, and he can suspend them when they are considered unnecessary. In 2005 Pope Benedict XVI, barely three weeks into his papacy and in no doubt of the sanctity of his predecessor, waived the traditional five-year waiting period before beginning the process that led to the beatification of Pope John Paul II. Equally Pope Francis has decided that there is no need to wait for a second authenticated miracle before declaring Pope John XXIII a saint. This isn’t favouritism towards popes. In 2012, for instance, Pope Benedict XVI put aside the regular processes and declared the twelfth-century nun Hildegard of Bingen a saint, and Pope Francis has similarly canonised the sixteenth-century Jesuit priest Peter Faber as well as the thirteenth-century Franciscan mystic Angela da Foligno. In these cases, the process is known as an “equivalent canonisation” and involves merely a declaration by the Pope. 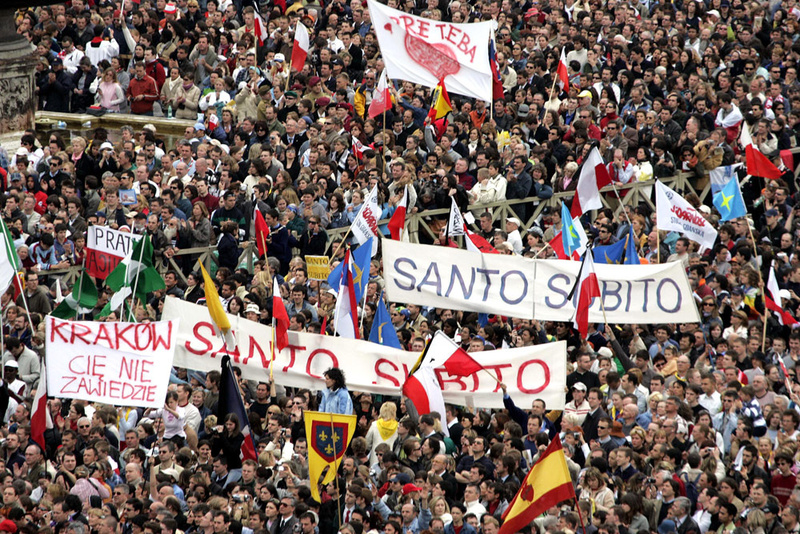 Crowds calling for Pope John Paul’s immediate canonisation during his funeral in 2005. Given the massive popular devotion to John XXIII – widely known as il papa buono, ‘the good pope’ – and John Paul II – at whose funeral Rome echoed to the cry of ‘Santo subito!’, meaning ‘sainthood now!’ – it is unsurprising that Francis and his predecessor Benedict XVI felt the Church would best be served by speedy canonisations. By doing so, Francis has reached back into the early history of the Church. The canonisation process was only centralised in 1588, and before 1234, when Pope Gregory IX introduced procedures to investigate the life and miracles of candidates for sainthood, there was no formal process of canonisation at all. Saints used to be declared by popular acclamation. Francis speaks often of ‘God’s holy faithful people’, using a vision of the Church that comes from its earliest days and which was recovered at the Second Vatican Council. As he told Fr Antonio Spadaro in his famous Jesuit interview last year, God’s holy faithful people is ‘infallible in credendo” — that is, the body of faithful is a vehicle also of Christ’s revelation. From the earliest days of the Church martyrs and others seen as holy were normally declared as saints at the time of their deaths by local churches. The last of Rome’s pagan emperors, for instance, when attacking the early Church, claimed that Rome’s Christians had honoured Peter and Paul and worshipped at their tombs even within the lifetime of the apostle John, and the second-century Martyrdom of Polycarp described Christians in what is now modern-day Turkey gathering and treasuring the burned bones of their martyred bishop. In bypassing the normal legal processes for canonisation, in other words, Pope Francis is following the practice not just of his immediate predecessors, but of the earliest traditions of the Church. One of the main tasks of a bishop, and especially the Bishop of Rome, is to listen to the people. And God’s holy faithful people are good at spotting saints. This entry was posted in Uncategorized and tagged Benedict XVI, canonisation, John Paul II, John XXIII, saints. Bookmark the permalink.